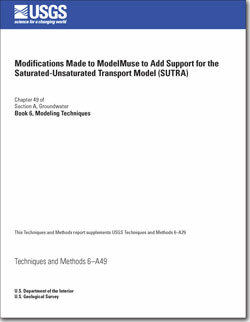 This report (1) describes modifications to ModelMuse,as described in U.S. Geological Survey (USGS) Techniques and Methods (TM) 6–A29 (Winston, 2009), to add support for the Saturated-Unsaturated Transport model (SUTRA) (Voss and Provost, 2002; version of September 22, 2010) and (2) supplements USGS TM 6–A29. Modifications include changes to the main ModelMuse window where the model is designed, addition of methods for generating a finite-element mesh suitable for SUTRA, defining how some functions shouldapply when using a finite-element mesh rather than a finite-difference grid (as originally programmed in ModelMuse), and applying spatial interpolation to angles. In addition, the report describes ways of handling objects on the front view of the model and displaying data. A tabulation contains a summary of the new or modified dialog boxes. This Techniques and Methods report supplements USGS Techniques and Methods 6–A29. Winston, R.B., 2014, Modifications made to ModelMuse to add support for the Saturated-Unsaturated Transport model (SUTRA): U.S. Geological Survey Techniques and Methods, book 6, chap. A49, 6 p., https://dx.doi.org/10.3133/tm6a49.